The 2 Brigade Nigeria Army says it has arrested 17 cultists with assorted arms and ammunition in Oku Iboku, Itu Local Government Area of Akwa Ibom. 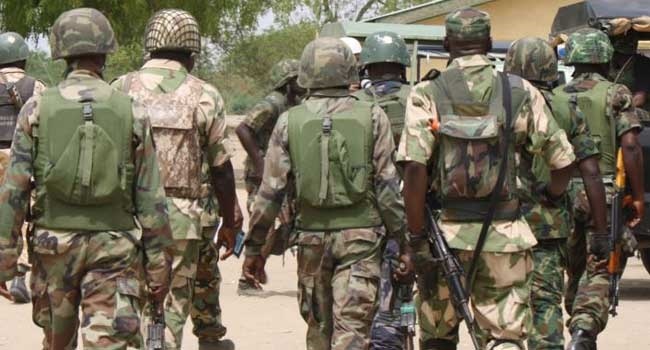 Soldiers have carried out a successful raid on hideouts of armed cultists at Oku and Itu bridges, located at the boundary between Akwa Ibom and Cross River States. The spokesman of the 2 Brigade Nigeria Army, Capt. Shuaib Umar, sent a statement to newsmen on Sunday in Uyo. He said they arrested 17 cultists with assorted arms and ammunition. “During the raid, we arrested 17 cultists with assorted arms and ammunition including two G3 rifles, two pump action rifles, five locally made pump action rifles, and four G3 magazines. “We also recovered 16 machetes, 125 rounds of 7.62 mm NATO, 223 live cartridges, among others. “Also recovered were a pair of military camouflage uniform, a camouflage T shirt, camouflage singlet, a cardigan, 10 mobile phones, a bag of charms, a bag of clothes and one wrap of Indian hemp,” the statement said. It further said that the army recovered N29,700 cash and three motorcycles. Meanwhile, the Brigade Commander, Maj. Gen. Abdu Ibrahim Hassan, has assured members of the public of adequate protection against miscreants and cultists. “We shall do everything possible to rid the area of such irritants, but our success will depend on the support we get from members of the people; everyone must be ready to report any form of crime to us,” he said.